I found a "giant" Barbie at a Thrift Store & thought "Aha, she will make a perfect reliquary!" Reliquaries can be ornate gold filigree boxes or in the shape of body parts like a head or foot. Reliquaries contain precious religious or spiritual objects such as the pinkie finger of a saint or a hair of Buddha. Usually there is glass involved so that you can peer into the reliquary & admire the object. SPRING has been a looooooooong time coming to Estes Park this year- and the longing for SPRING has permeated my soul for months now. My thoughts are filled with how precious spring is, with it's new green growth, budding flowers, warm temperatures, chirping birds, rain storms instead of snow etc. Barbie sort of represents the SPRING of our lives- no longer a child, a maiden (of epic proportions!) not a mother or elder. So, I felt Barbie was perfect for a SPRING Reliquary! I pressed our first flower of spring- a Pasque Flower & encased it in glass in the top of her head- it is the relic representing SPRING. 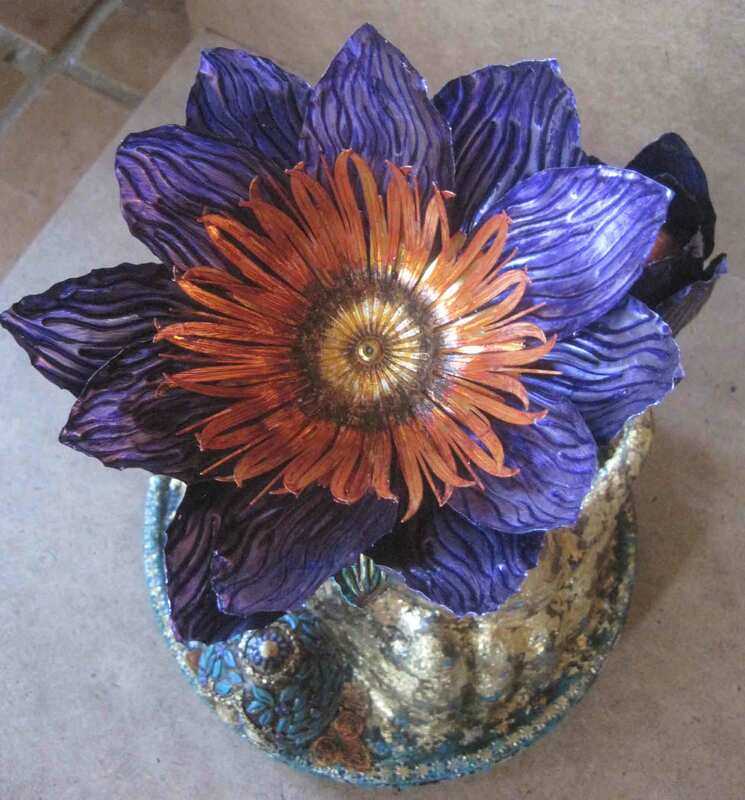 When you remove the metal embossed flower from the top of her head it reveals the Pasque Flower within. She holds a bud- of possibility- the top comes off so that another object can be placed within it by the owner. and on the bottom is my little joke- feet made out of springs.